This is an Intraday trading system based on the Camarilla exchange indicator. Time Frame 30 min and 60 min. Open price is between open buy-2 and open buy-3 levels. Wait for the price to go below open buy-3 and then when it moves back above open buy -3 , buy entry. Stoploss is 15 pips below openn buy-3 level. Target open buy-2 level. Open price is between open sell-2 and open sell-3 levels. Wait for the price to go above open sell-3 and then when it moves back below open sell -3 , sell entry. Stoploss is 15 pips above open sell-3 level. Target open sell-2 level. Open price is outside the open buy- 3 and open sell-3. Wait for the prices to come in range. Long entry when the price is above open buy-3 level. 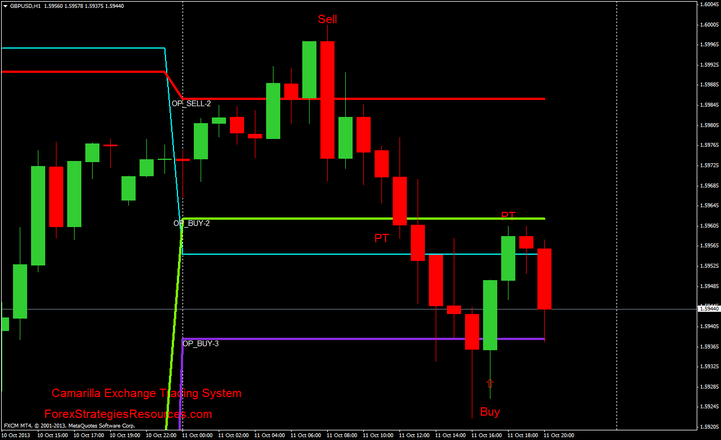 Short entry when the price is below open sell-3 level. The Stop loss and the profit target are, as the previous scenario. Open price is between open sell-2 and open buy-2 levels. Wait for the prices breaks the range . Wait for the price to go below open buy-2 and then when it moves back above open buy -2 , buy entry. Wait for the price to go below open buy-3 and then when it moves back above open buy -3 , buy entry. Wait for the price to go above open sell-2 and then when it moves back above open sell -2 , buy entry. Wait for the price to go above open Sell-3 and then when it moves back above open sell -3 , buy entry. The Stop loss is 15 pips above or below the level. Profit Target is the next level. Note: Recommended to use Move Stop loss and Profit Target predetermined 15-20 pips.